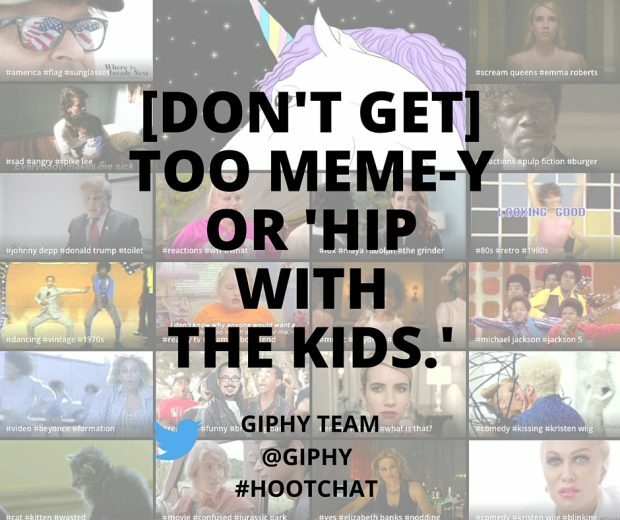 The GIF experts from GIPHY—the wildly popular GIF creation app and library—recently joined us for a #HootChat all about GIFs. Needless to say, it got animated. For the uninitiated, GIFs are animated image files. Though they’ve been around for awhile, GIFs are back in style and brands are getting in on the action. 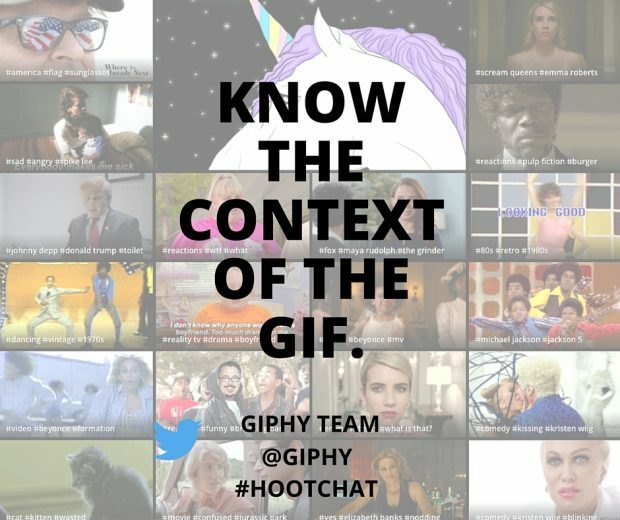 If you’re new to the format, you can get a primer on GIFs—what they are, where to find them, and how to use them—in our comprehensive GIF guide. There are two camps regarding the correct pronunciation of the term: soft “g” as in “giraffe” and hard “g” as in “garbage”. Those who pronounce it with the soft “g” (“jif”) do so because the format’s creator says that’s correct. Those who pronounce it with a hard “g” do so because of what the acronym stands for: Graphics Interchange Format. For the record GIPHY (pronounced with the hard “g”) sits firmly in the second camp. However you pronounce it, there’s no denying that social media users love GIFs. And no one on the internet knows them quite like GIPHY. The salient point here is that GIFs, like anything you post on social media, should have appropriate context. If they don’t, you may start running into problems. For instance, maybe you’re sharing a post on Twitter and you want to spice it up with a nice GIF to catch people’s eyes as they scroll through their feed. You pop in a couple of keywords and bam! There it is: the perfect GIF. It says EXACTLY what you were looking for. There’s just one problem. You’re not sure what it’s from. This should be a red flag. The vast majority of GIFs out there are snippets of pop culture—memes, tv show clips, movie moments—and that means that they can have more meaning attached to them than appears in the GIF itself. Before you share anything, you should make sure that you know what that context is so that you don’t accidentally share a GIF that definitely doesn’t mean what you thought it did. Whether that means asking a coworker or searching the reference online, it’s well worth the extra step. But if you’re not using GIFs for movie quotes or clips from popular tv shows, what good are they really? Plenty, as it turns out. While humorous GIFs can boost engagement on social and make a brand more relatable, there are lots of other ways to use GIFs to showcase your brand. Business 2 Community suggests using GIFs for to animate data, play ads, or create more compelling how tos, product demos, ads, and more. Of course, the odd Parks and Rec GIF doesn’t hurt (so long as it’s on brand for your organization). Need a little inspiration? 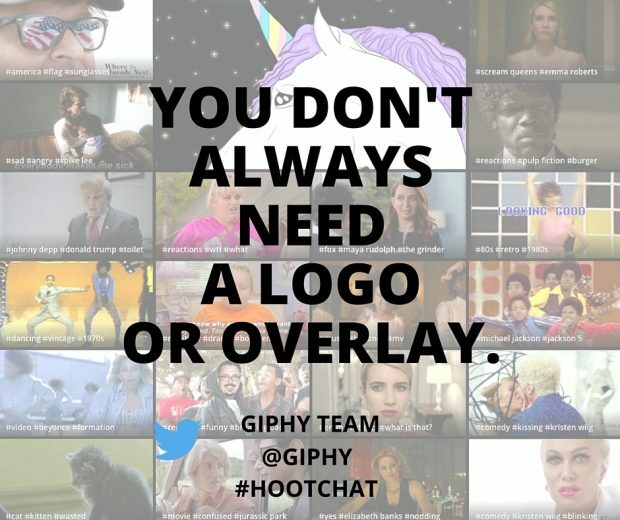 Check out these five brands using GIFs the right way on Twitter. So let’s say you’ve created a fantastic, original GIF to share on your brand’s social accounts and—of course—you’re super proud of it. But that doesn’t mean you should drown it in logos. Keep it simple and skip the over-done branding in favor of a mini logo in the corner, some subtle product placement, or no official branding at all. Basically, don’t hit people over the head with the fact that it’s branded content. They’re more likely to respond favorably. Want to learn how to make your own GIFs? GIPHY has a guide on how to use their GIF Maker and upload the results to the site. Kick your social media game up a notch by scheduling GIF posts in Hootsuite.